Gain a rich experience and understanding of Bridges components and structure. Investigate daily schedules and yearly pacing. Explore ways to organize classrooms and materials. Experience and understand the CCSS Content Standards for Mathematical Practices. Discover a wealth of online resources. 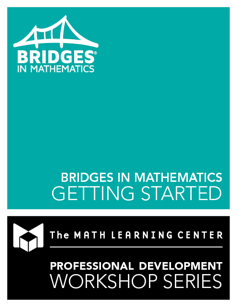 Learn ways to use Bridges materials to meet the diverse needs of all your students. Understand the assessment opportunities Bridges provides. Typically two days (consecutive days, 12 hours total). One-day workshops can also be scheduled depending on the size of district/school and the number of professional development days a district/school has available. Mainly classroom teachers. Support staff, coaches, and administrators may also attend as space allows.